Click here for more on Social Vulnerability. Click here for more on Geographic Vulnerability. Just as different groups experience disparate impacts from climate change, they also possess different capacities for recovering from disruption. This concept, known as resilience, commonly refers to the ability to rebound from withstand chronic stresses, like flooding, heat, or even unemployment, without losing the ‘normal’ rhythm of life. This is what many organizations refer to as adaptive capacity. However, a more justice-oriented approach to resilience notes that maintaining ‘normal life’ also means maintaining the unequal social structures that create greater vulnerability in disadvantaged communities. Instead of making unequal structures resilient and therefore more lasting, resilience should focus on recovering from stresses in ways that enable people to reorganize social systems more equitably, ultimately building greater resilience for everyone. Click here for more on Resiliency Assets. 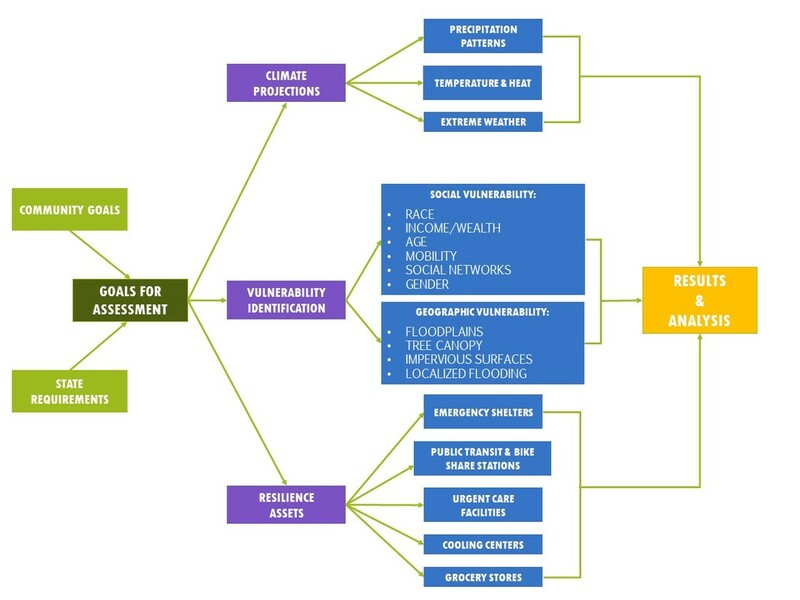 Our method for determining the differentiated vulnerability and resilience within a town or city is relatively simple. By combining demographic data with geographic and infrastructural data on several maps, we can tell which neighborhoods would face the greatest exposure, sensitivity, and adaptive capacity/resilience in responding to climate hazards, and create a visual and numeric index of relative vulnerability between neighborhoods. This data is then summarized into four maps: social vulnerability, geographic vulnerability, resilience, and critical infrastructure.